Unusually for a Breguet wristwatch, which is often the embodiment of classical design, the Marine Équation Marchante 5887 is notably contemporary. 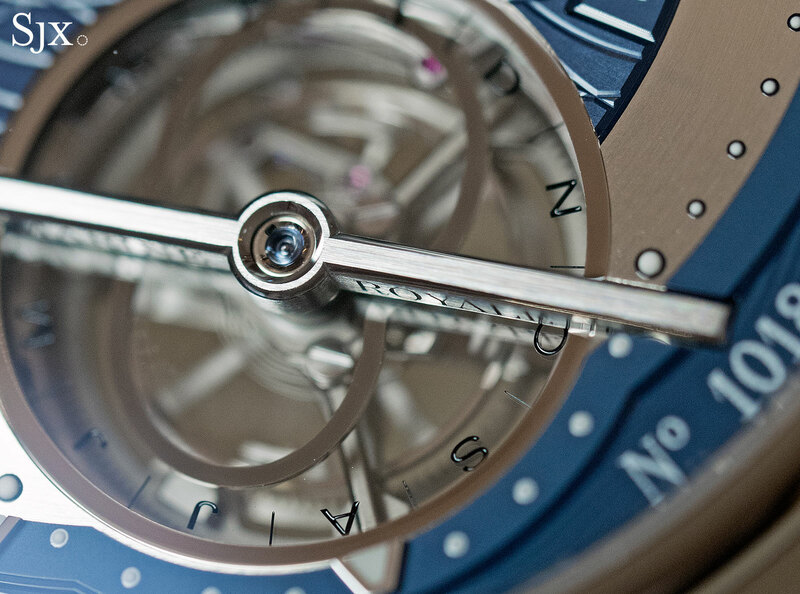 The styling retains many signature Breguet design elements but is distinctly modern, while the complex movement blends traditional decoration with high-tech materials and production techniques. “Équation Marchante” translates as “running equation”, most notable feature of the ref. 5887 that takes the form of a secondary minute hand tipped with a gilded Sun that indicates the equation of time. Relative to a conventional add-or-subtract equation of time display, a “running equation” is superior, being both more legible and visually intuitive. An equation of time tells time as it really is, based on the Earth’s motion relative to the Sun. Because the Earth’s axis sits at a slightly oblique angle to the Sun, and it also orbits the Sun on an elliptical track rather than a perfect circle, the actual length of a day is not exactly 24 hours – that is known as apparent solar time. The time shown on ordinary watches is based on the simplified 24-hour day known as mean solar time. The difference between the two is the equation of time. The equation of time varies throughout the year. Apparent solar time is as much as 14 minutes behind conventional time in February, and up to 16 minutes ahead in November. Most equation of time watches display just the difference between the two, usually with a sub-dial that with a scale that runs from “-15” to “+15”. While functional this sort of display is neither strongly legible or intuitive, since it tends to be small, approximate and requires mental mathematics. A running equation of time solves that problem with a second minute hand that indicates apparent solar time in real time. So the hand speeds up when apparent solar time runs ahead of conventional time, as it does in November, and slows down in February. In fact, the equation of time hand more or less tracks the motion of the Earth relative to the Sun. Though the running equation of time existed in historical clocks and pocket watches, only a handful of modern day watchmakers have produced timepieces with this complication, including Vacheron Constantin. But the first to do it in a wristwatch was Blancpain, which premiered its Équation du Temps Marchante watch in 2004. It’s worth pointing out that Blancpain is a sister company of Breguet, both being part of watchmaking conglomerate Swatch Group. 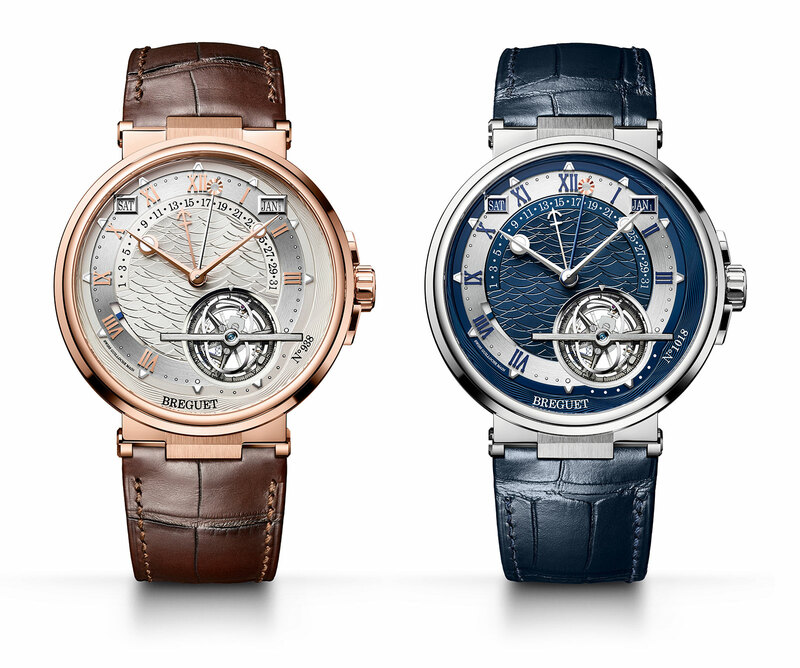 While the mechanics behind the pair’s running equation of time mechanisms are similar, Breguet says its equation marchante was developed independently of Blancpain. 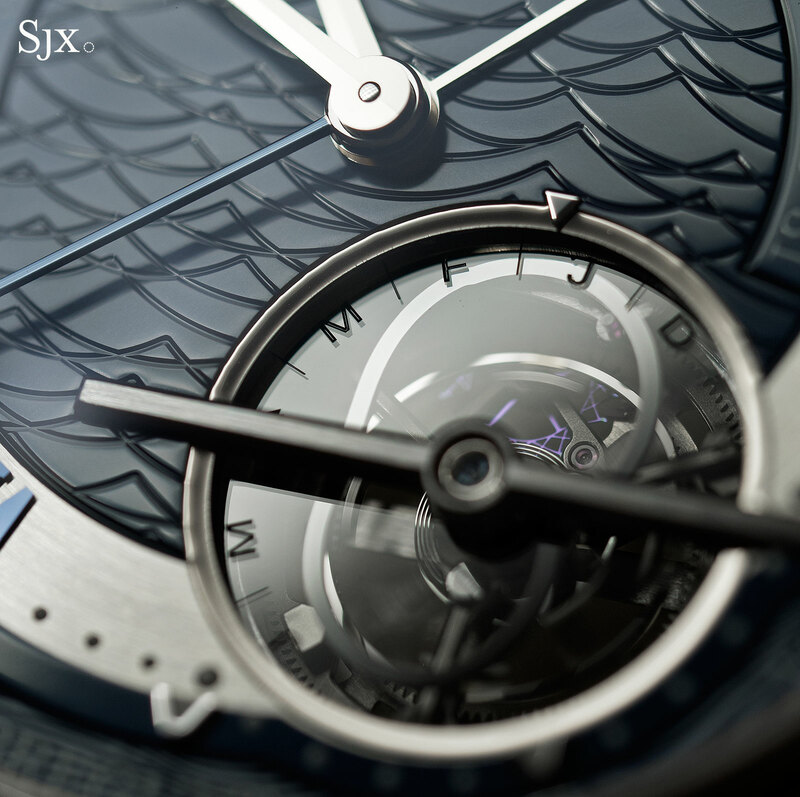 The running equation of time on the Marine Équation Marchante 5887 relies on two key components. The first is a cam shaped like a kidney that’s a miniature of the analemma curve, a graphical representation of the position of the Sun relative to the Earth. 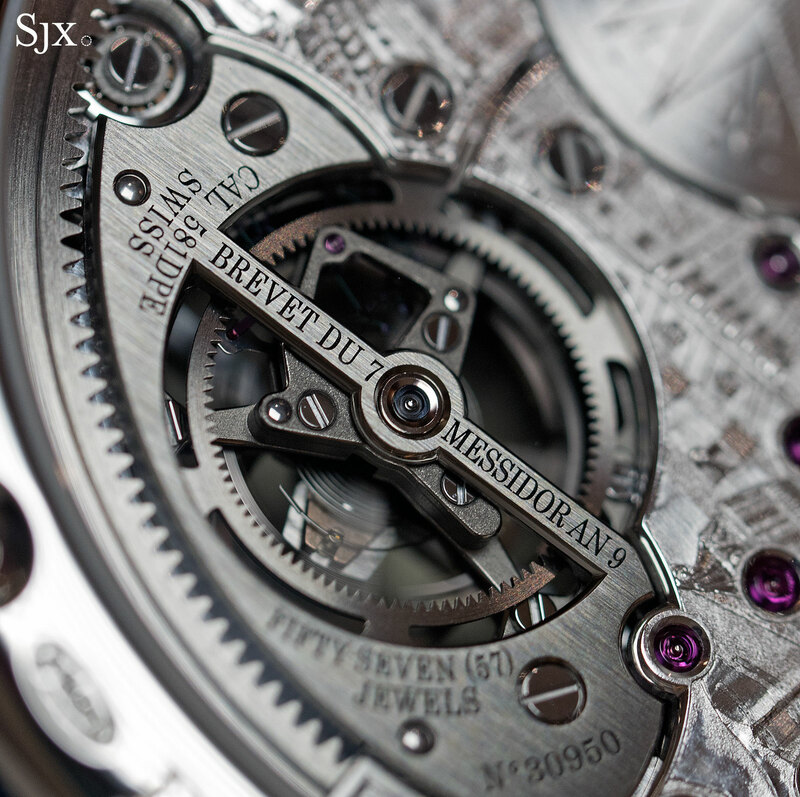 Made of nickel, the cam is extremely slim and fixed to the underside of the clear sapphire disc visible at five o’clock. The cam is produced via LIGA, a lithographic process that combines moulding and plating to create high precise, microscopic parts that can be deposited directed onto other materials, including sapphire crystal. 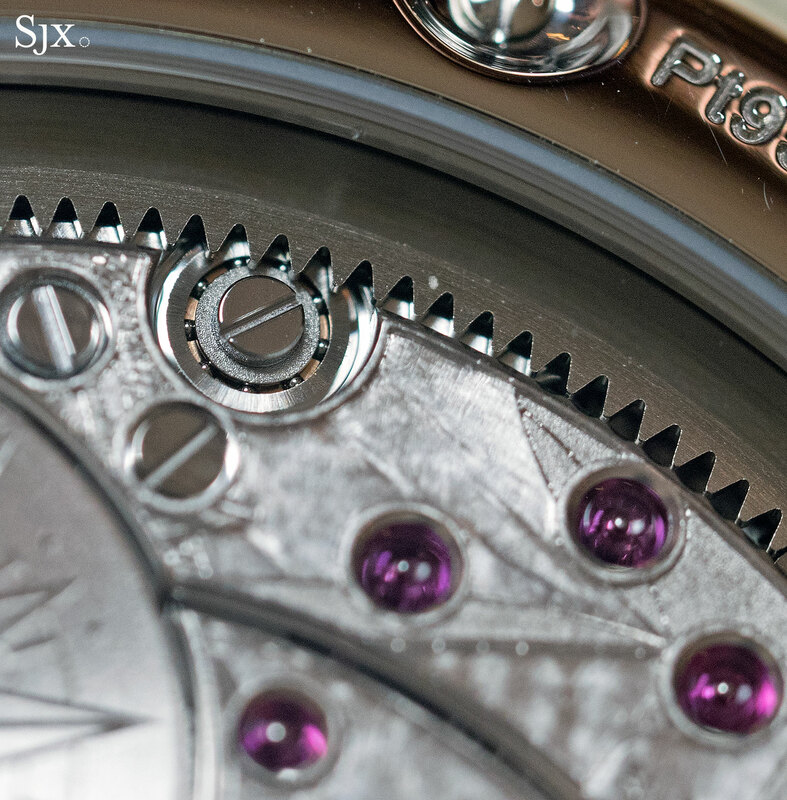 The cam makes one complete revolution over the course of a year and as it rotates, a pivoted, fixed finger tipped with a roller jewel traces the inner curve of the cam. As the cam turns, the motion of the finger translates the shape of the cam into the non-linear movement of the Sun-tipped minute hand. This non-linear motion requires a differential linked to both the trains for apparent and mean solar time, which allows the secondary minute hand to move at a varying rate, both backwards and forwards, over the course of a year. 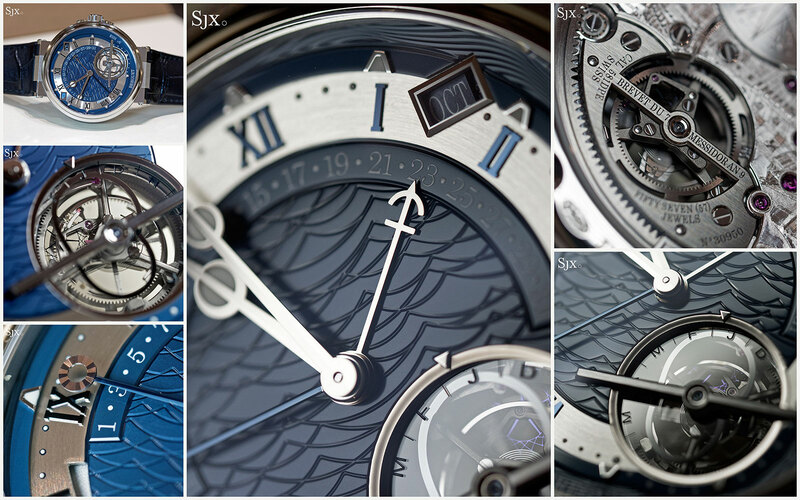 Breguet labels the Marine Équation Marchante 5887 a grande complication, so there’s more to it. In addition to the running equation of time, the cal. 581DPE inside is also equipped with a power reserve display, as well as perpetual calendar that indicates the day, month and leap year in twin windows, along with the date on a retrograde scale. And positioned on the same axis as the equation of time cam is an one-minute tourbillon with a lightweight titanium cage as well as its hairspring, escape wheel and pallet jewels in silicon. 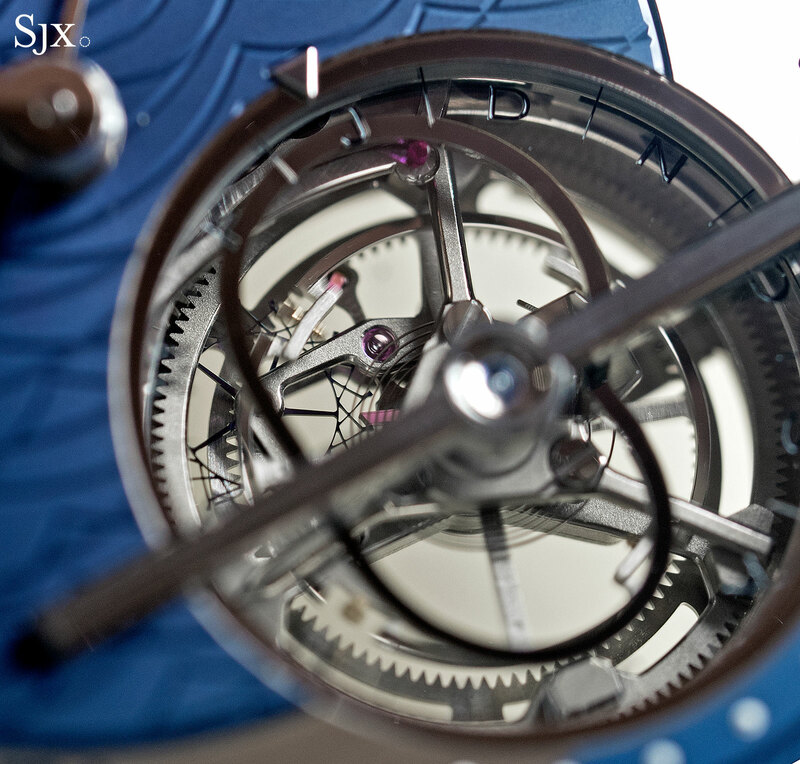 Unlike most tourbillons that have a slow-beat balance, the regulator in the Équation Marchante beats at 4 Hz, or 28,800 beats per hour, a feat largely thanks to the low-friction and lightweight silicon components in the escapement. And the recognisable tourbillon reveals the identity of the base movement that powers the Équation Marchante: the same one that’s found in the Breguet Tourbillon Extra-Plat 5377. Though the perpetual calendar and equation of time are complications built on top of the tourbillon calibre, the entire movement remains commendably thin at just 5mm high. Besides the tourbillon, the other novel feature of the base movement is its peripheral winding mechanism: the narrow, solid platinum rotor is mounted around the edge of the movement, instead of over the bridges as is convention. First experimented with in the 1970s but abandoned due to sheer inefficiency, the peripheral rotor is now practical thanks to improved technology. It’s primary advantage is slimness, since it does away the added height of a normal rotor, while also having the benefit of leaving the movement entirely uncovered. For that reason the peripheral rotor is also found in Vacheron Constantin’s remarkably slim split-seconds chronograph and the ultra-flat minute repeater by Jaeger-LeCoultre. Audemars Piguet also put it inside the Royal Oak Offshore Tourbillon Chronograph, but mainly to accommodate the integrated chronograph mechanism. The rotor is mounted on three rolling bearings and winds the mainspring via an extremely large tooth wheel that surrounds the movement. Despite the lower efficiency of such a setup compared to a regular automatic mechanism, the Équation Marchante still boasts a respectable 80-hour power reserve (that’s just over three days), which can also be partially attributed to the effiency gains of the silicon components. An ordinary Breguet might be described as elegant and delicate, but the Équation Marchante is, in contrast, imposing and hefty, possessed of the look of a modern day grand complication. 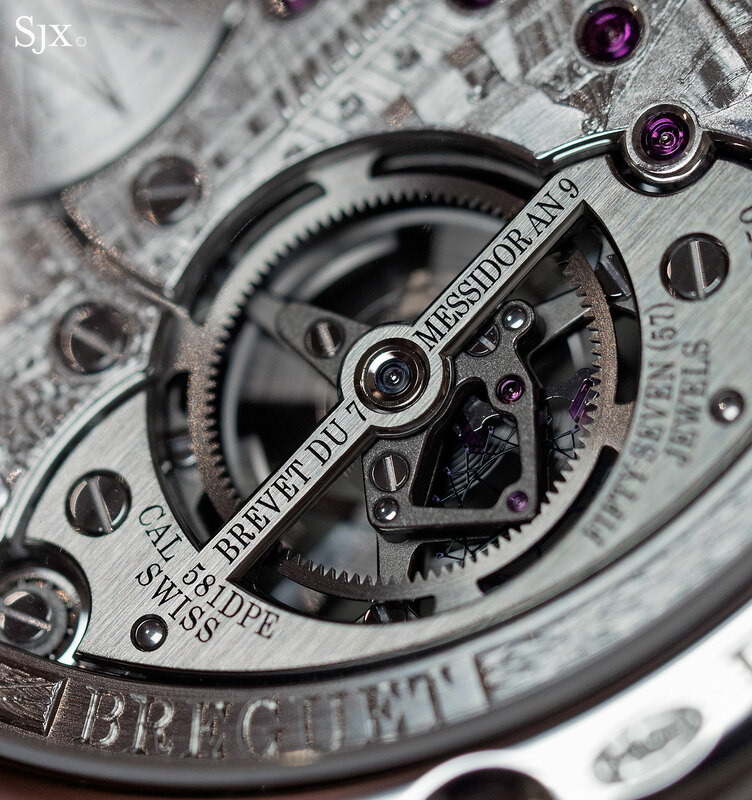 The case is 43.9mm in diameter and 11.5mm, not oversized by the standards of comparable complications, but large for a Breguet. The Équation Marchante is, in fact, a sports watch of sorts, being part of the Marine line of luxury sports watches catered less for swimming than for lounging on a large, even oligarch-worthy yacht. Consequently it has a screw-down crown with a depth rating of 100m. While the Équation Marchante still retains many of the brand’s key elements, including the fluted case band and Breguet-style hands, the design is a modern take on the old fashioned Breguet look. 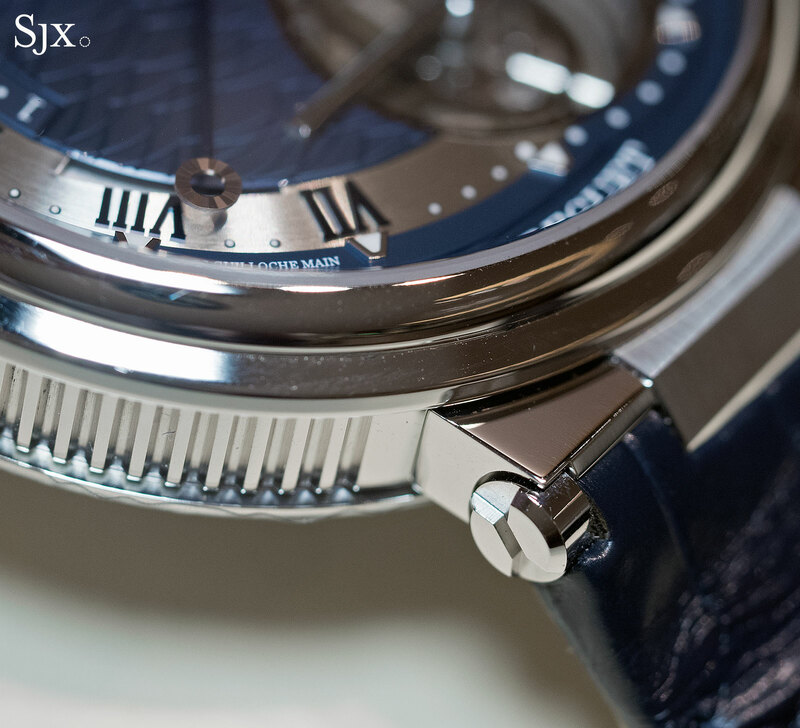 Gone are the narrow strap horns found on most Breguet watches, in their place are a pair of angular, integrated lugs. 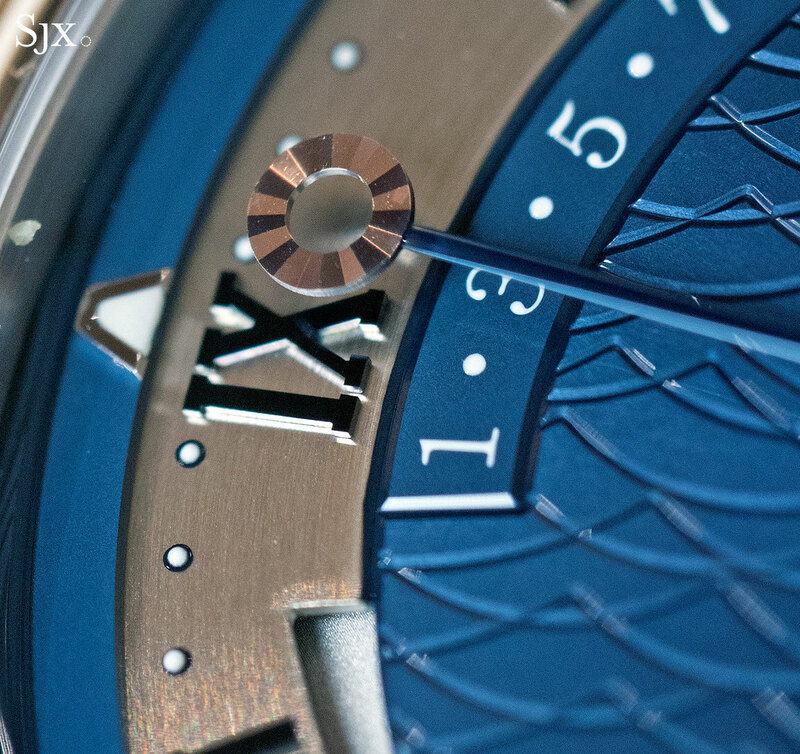 Other facelifted design details include the Super-Luminova filling inside the tips of the hands, the applied Roman numerals and the prominent wave guilloche on the dial. 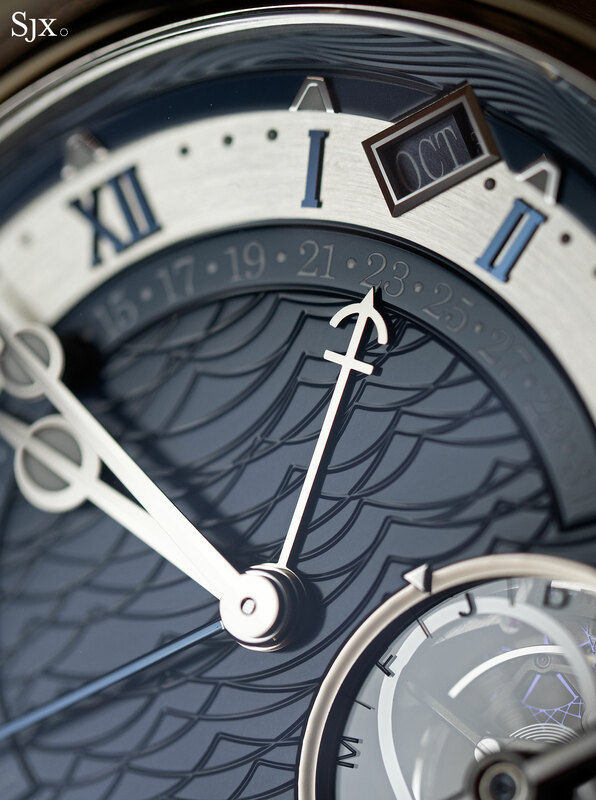 The guilloche dial is just one aspect of the nautical theme running throughout the watch, a motif explained by the fact that Abraham-Louis Breguet was official clockmaker for the French navy in the early 19th century. 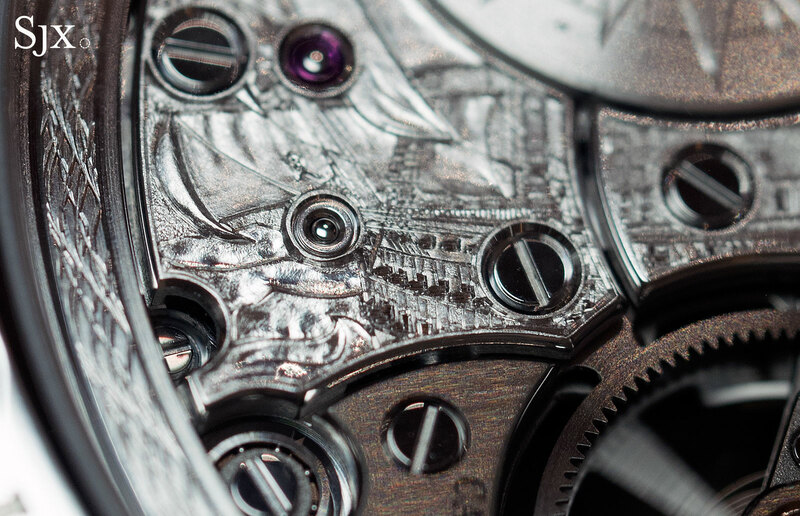 Continuing with the theme, the bridges of the movement – visible in all their glory thanks to the peripheral rotor – are hand-engraved with the Royal Louis, a 19th century sailing ship that was the last vessel to bear the name that was traditionally bestowed on the largest ship in the Royal French navy. 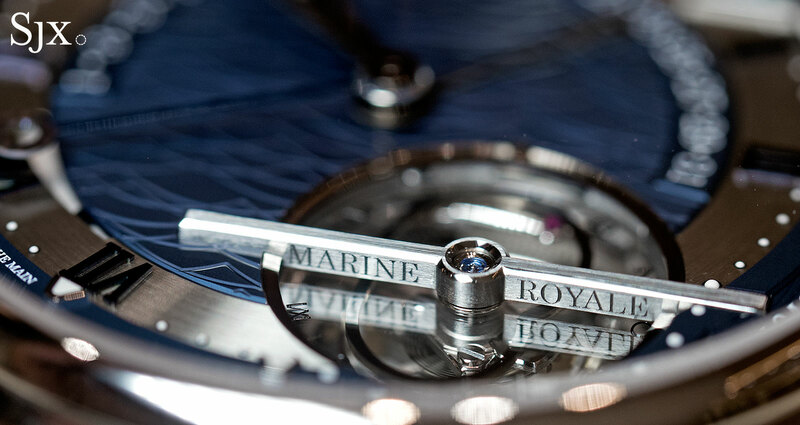 The top of the floating barrel is engraved with a compass rose, “Marine Royale” is engraved on the vertical faces of the tourbillon bridge, while the retrograde date hand is shaped like an anchor. 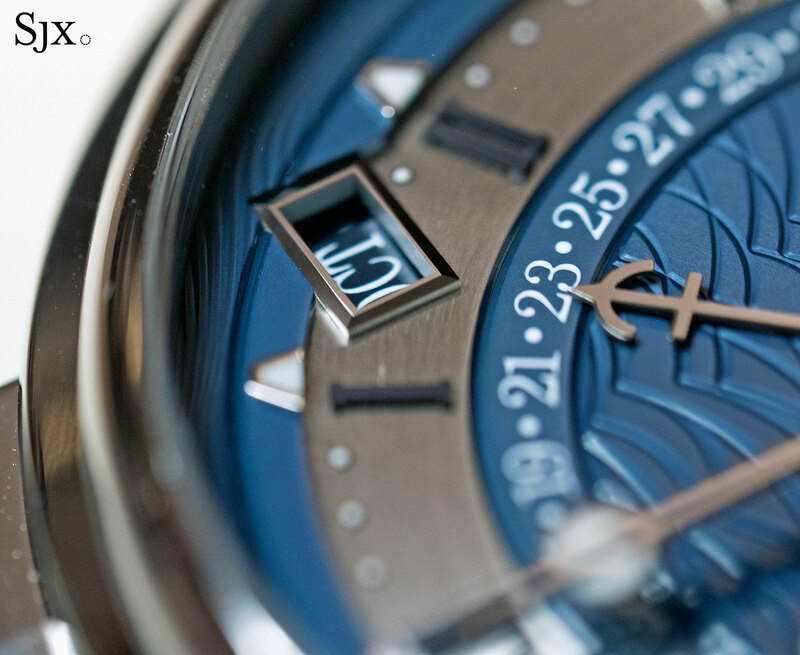 The maritime details are unsubtle, though they give the watch a fresher look. Traditionalists, however, would probably want to wait for a Classique version of the equation of time. 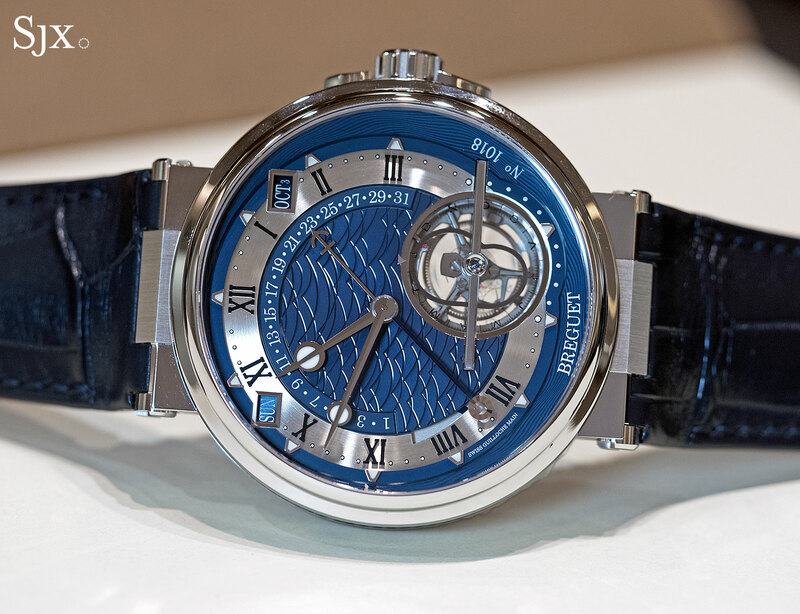 Though the design is new, all the constituent components are as elaborately and expensively executed as they are on classical Breguet watches. The dial, for instance, is solid gold, while the wave motif is engraved with a rose engine just as it would be for traditional patterns like barleycorn or hobnail. Similarly, the applied Roman numerals are blued steel, while the hands are 18k gold, and the calendar displays are framed in finely bevelled windows. 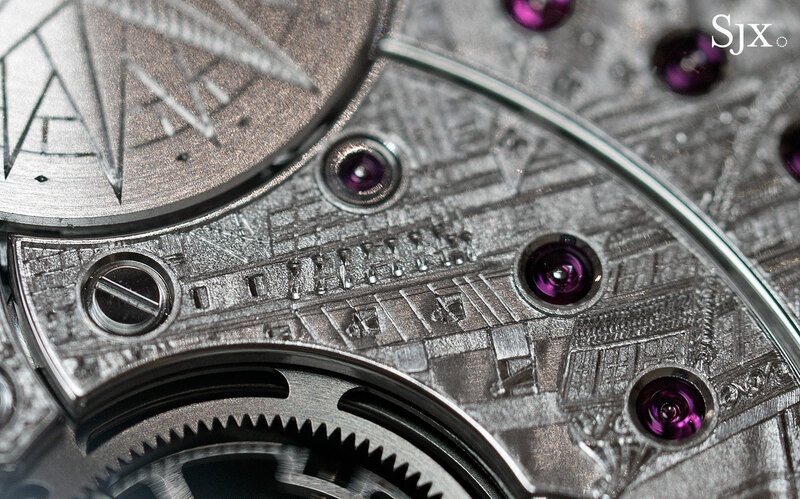 Similarly, while the movement construction and layout is modern, the hand-engraving demonstrates intricate detail. 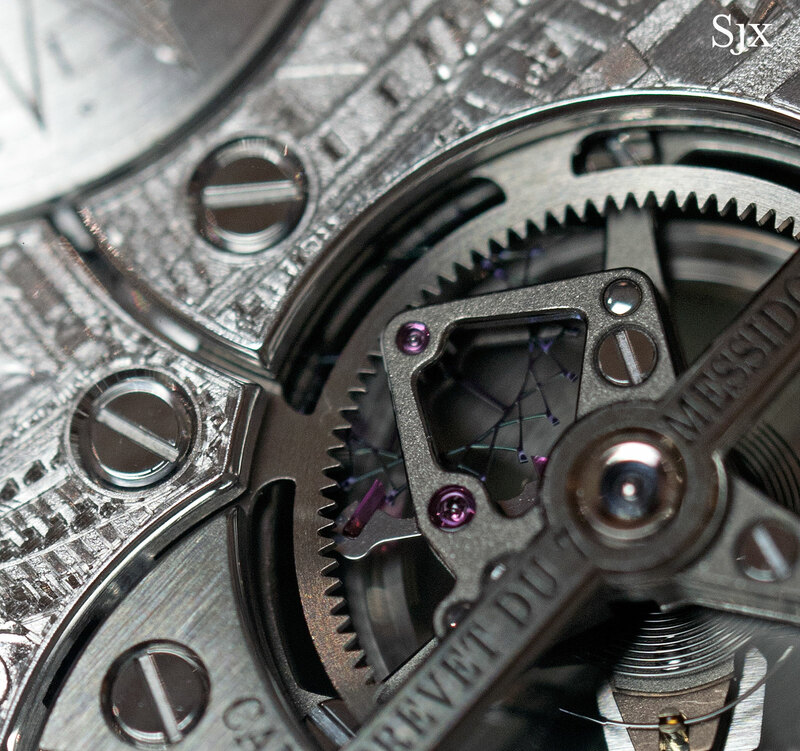 The only detail inside that stands out, or rather does not, is the titanium tourbillon cage. Though the use of titanium is practical – it’s almost half the density of steel meaning the cage requires less energy to turn – the choice of metal does result in some aesthetic compromise. Despite the cage being decorated with a frosted surface and polished bevels, the natural colour of titanium means it lacks the brightness found in an equivalent component that’s made of steel. The Marine Équation Marchante 5887 is available in 18k pink gold or platinum, with both being identical save for the colours. The pink gold version still retains a vague feel of the old school Breguet look thanks to its silvered dial, while the platinum model is unabashedly modern. Both cost almost the same, however, with barely a 7% difference in retail price. 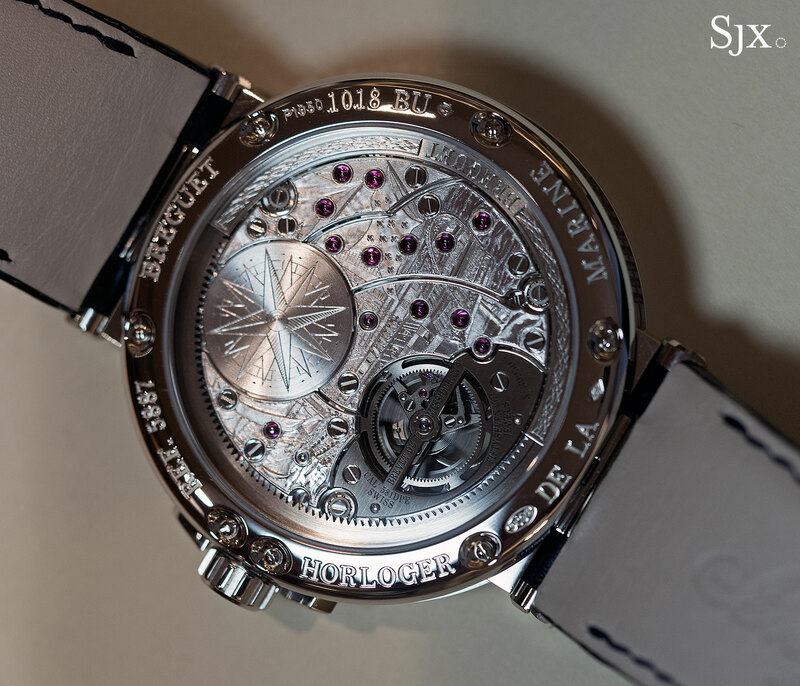 The Équation Marchante in platinum (ref. 5887PT/Y2/9WV) costs US$230,400 or S$331,000. The same in 18k rose gold (ref. 5887BR/12/9WV) is priced at US$215,000 or S$309,000. It’ll be available at Breguet boutiques and retailers in the final quarter of 2017.